Just a couple weeks ago I received an invitation to preview the new Ivy Ultra Lounge and Wine Bar located in the Ivy Hotel, which is one of San Diego's luxury hotels located in the heart of Downtown San Diego. Inside this 'new' wine bar you'll find row after row of Enomatic type machines made by Napa Technology where guests are able to explore 80 different world wide wines on the menu and at their leisure. There is no pressure, just grab yourself a glass and tell your server or bartender you'd like to purchase a Smartcard. This card which is very much like a pre-charged debit card allows you drop x-amount of dollars on the card and then you’re off to races. After your taste is poured directly into your glass, glance upward to the digital display and it will let you know your balance so there is no embarrassment when you try to pour yourself a taste and are informed that your request was denied. Oh, don't remove your glass to quickly as there is a small hiccup at the end the pour that you won't want to miss. The Tasting Menu: Each guests will have an opportunity to enjoy wines ranging from high-end “cult” and boutique varietals to the tried-and-true (where I saw a few grocery store wines as well), without paying for steep bottle prices. 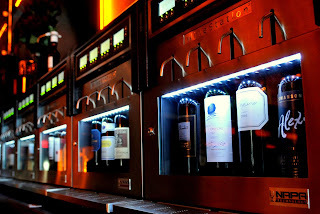 This type of operation allows guests to explore the wines in three different formats, which are Taste (1.5 oz. ), Half (4 oz.) and Full (6 oz.) glasses at the perfect temperature from Napa Technologies new high-tech, interactive enomatic wine machines found in the Ivy Hotel's new Ultra Lounge and Wine Bar. How does it work: According to Napa Technology WineStation with its patent pending CleanPour ™ hygienic dispensing head technology, WineStation delivers the first time taste the wine maker intended, every time, for up to 60 days (using argon or nitrogen gas) and even lets you prepare, preserve and store your favorite wines when they are out of the unit. The Jury is still out: Not completely convinced that the wine station or the Italian made Enomatic - Wine Serving Systems deliver as promised, "the first taste the wine maker intended every time". Making a comparison of a newly loaded wine (just uncorked) and the other wines which were in the machine for days, I still found the wine which just uncorked to be a fresher by comparison to the one held fresh by argon gas. The wine list: Eighty different wines on the list range in price from $1.76 for a Taste of the 2007 Willamette Valley Riesling produced by Willamette Valley Vineyards (Oregon) to a full glass of the 2004 Opus One (Napa Valley) for $28.47. They also have a nice selection of Port available for you to explore. These high-tech Wine Stations are designed to keep each vintage at peak freshness, allowing you to create your own tasting experience with a touch of a button. A few of the highlights are; Opus One, Peter Michael “La Carriere” and Shafer “Hillside Select” and a few lowlights the Qupe entry level Syrah. Price Comparison: Let's take the Opus One (Napa Valley) at $28.47 for a 6 oz. pour times 4.23 (which is 6 oz. divided by 25.4 oz.) and considering there are about 26 and two third ounces of wine in each 750ml bottle and you come out with $120.52 per bottle which is a fantastic price! The lowest price I could find online was $149.00 and the highest price was $189.00. Not sure how they are getting such a great price per bottle, but that is a great benefit for the those wanting to experience a high caliber wine, without the high caliber price tag. The other side of the Coin: Ah yes the other side of the proverbial coin, do the math. If you take the other wine in this article, the 2007 Willamette Valley Riesling produced by Willamette Valley Vineyards (Oregon) which can be found online anywhere from $8.99 to $10.99 per 750ml bottle and if measured out for $1.76 for a 1.5 oz. pour, which divides into 25.4 ounces (750ml) and equates to 16.9 tastes and that bottle is now $29.74 ouch! So to get the most "bang" for the buck, it would behoove you to go for the full pour. Enhancing the tasting experience: While you taste the various wines you are invited to munch on some of their lovely appetizers. The highlights that evening included a Prosciutto and Arugula Pizza, Chacuterie Plate, Blue Cheese Stuffed Dates Wrapped in Bacon with Grated Parmesan and Duck Rillets, which were all wonderful. The Executive Chef of the Ivy Hotel, Nathan Coulon created an interesting range of appetizers designed for wine-pairing and some of those wonderful treats were sampled that evening. Wine-friendly desserts incl ude Strawberry Semi-fredo, Macerated Grilled Peaches and Belgian Chocolate Torte. Now while these appetizers are designed for pairing, it's not necessarily clear which item pairs with what, that guess is left up to you. Wrapping Up: This is a great place to grab a glass of wine and relax with friends, as they have abundant seating from tables to comfy couches. They also have lovely restaurant to dine in and a place to go dancing if you feel like kicking your heels later. With at least 80 wines by the glass, it represents a good opportunity to try many different wines without the commitment of a whole bottle. If your downtown and would love to just grab a great glass of wine by the glass, I would highly recommend dropping by. Until next time cheers everyone! I took a peek in there the day of their grand opening party. They were still setting up the wines, but they seemed to have a nice selection of higher end stuff - wines that I wouldn't mind paying extra $$$ for by the glass. No Broman, though. Yet. There selection of wine really runs the gamut, from Opus One to Qupe. Not sure why they don't have Broman, but with a little encouragement I am sure they would love to feature your wine. Cheers!